Eda is a direct descendant of the Wari people of Peru. She inherited ancient traditions and profound knowledge related to plants, spirits and magical storytelling from her ancestors. Indigenous wisdom from the Highlands (Huarochiri and Huanta) and the Amazon Rainforest (Ashaninka Tribe) is a part of her DNA. She is well educated and studied sociology and anthropology at Catholic University in Lima, Peru. 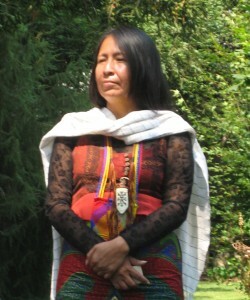 After her first experience with her Master Plant in 1989 while living with magical beings in the jungle and spiritual guardians of the mountains (Apus), Eda reconnected with her ancient knowledge and became aware of the incredible wisdom that her ancestors passed on to her as a child through her grandmother. Upon this awakening, Eda would never return to live or work in Lima. She felt a powerful calling to stay deep in the Amazon forest or up in the highlands. Over a twenty five year journey, Eda became a Shaman, a healer, a curandera. The true essence and meaning of her life is in honoring the ancient wisdom of her ancestors and practicing the new skills that nature, plant medicines and Indigenous Elders pass on to her. Serving her people, Eda has become a spiritual leader in her tribal community and supports their efforts to defend their territories– the pristine forests, natural resources and headwaters. Today she walks among the indigenous, modern and global worlds. She brings technical assistance to indigenous communities to protect their lands legally, to preserve the amazing sources of native plants, trees, animals and water and to help perpetuate the ancient healing practices among her people and others. 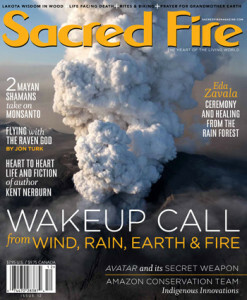 Eda is both a Shaman and an activist. To stimulate interest in and support for her life’s work, she offers her ancient wisdom as a healer and explains how essential it is to preserve the rainforest. She does this by traveling around the United States, Chile and Peru sharing experiences and knowledge. Eda conducts personal and group healing ceremonies, spiritual journeys, Shamanic retreats and workshops and also participates in conferences and forums. She has been closely involved with Native American Healers and Elders, learning and participating in sacred ceremonies such as Sundance, Peyote and Sweat Lodges. Recently Eda has been researching and writing her first published book about indigenous knowledge and the role of Shamanic medicine women in the Peruvian Amazon. She was also included in the 2010 book of interviews entitled Cosmic Visions: Dialogues on the Nature of the Universe and the Search for Reality by Stephan Martin.